Apart from the newly done rear profile, the front and side profile gets the same treatment as seen on the Tiago hatchback. Fewer changes to the front include a smoked projector headlamp which also gets integrated LED DRL’s as well. The lower bumper houses round shaped fog lamps with chrome embellishments. The Tigor also gets Tata’s signature grille with Hexagonal detailing and Tata Motors logo at the centre; this grille can also be found in the Tiago hatchback as well. The side profile too looks identical to the hatchback with no such noticeable changes. 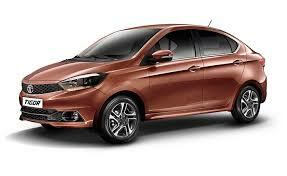 However, it does get two different alloy wheel patterns for the petrol and diesel variants respectively.Thus with all the changes mentioned above calling the Tata Tigor one of the most proportionate looking compact sedan’s currently available in the Indian market won’t be an understatement. In terms of driving, the Tata Tigor ride has a very supple ride. It irons out most of the road bumps and it does a fairly good job. The handling too, is one of the best in its segment. Push it around a bend and the hatchback does a good job. The steering wheel is light and still has good enough feedback. This is what makes it stand out.The fuel tank capacity of the Tata Tigor is 35 litres, which will be sufficient for long road trips as well. The ride quality of this vehicle is good and what stands is its handling. It is a good mix of ride quality and handling characteristics. The ABS on offer comes with EBD (electronic brake force distribution), corner stability control (CSC) for enhanced braking efficiency. What’s clear is that the Tigor is not just a Tiago with a boot. It’s got a different vibe and that’s all thanks to the way it looks. It is an attractive car and has a certain visual appeal that the typical compact sedan doesn’t have. In a sense, the Tigor will attract buyers to whom design and style get priority over practicality. That’s not to say the Tigor isn’t practical. Much to the contrary, it’s got a well thought-out cabin, ample interior space and a large and useable boot. At the same time, top-spec Tigor’s also address modern day requirements for connectivity and features.Where the Tigor could have been better is under the bonnet. Both the petrol and the diesel engine could have done with more power. In fact, given the good ride and handling package, the powertrain is the sole area where the Tigor feels a notch down to the existing compact sedans. But here’s the thing. The Tigor will come in under the Tata Zest, which by extension means it will be priced significantly lower than compact sedans like the Maruti Swift Dzire, Honda Amaze, Hyundai Xcent, Ford Figo Aspire and Volkswagen Ameo. Tata is said to be looking at an aggressive price tag for the Tigor with prices likely to range from Rs 4 lakh (estimated, ex-showroom, Delhi) for the base petrol to Rs 6.5 lakh for the top-spec diesel. And that means the Tigor could sit in a sweet spot in the market with no direct rivals.The Tiago hatchback has already shown there’s a market for a well-priced Tata. The Tigor has the potential to take things up a few notches.